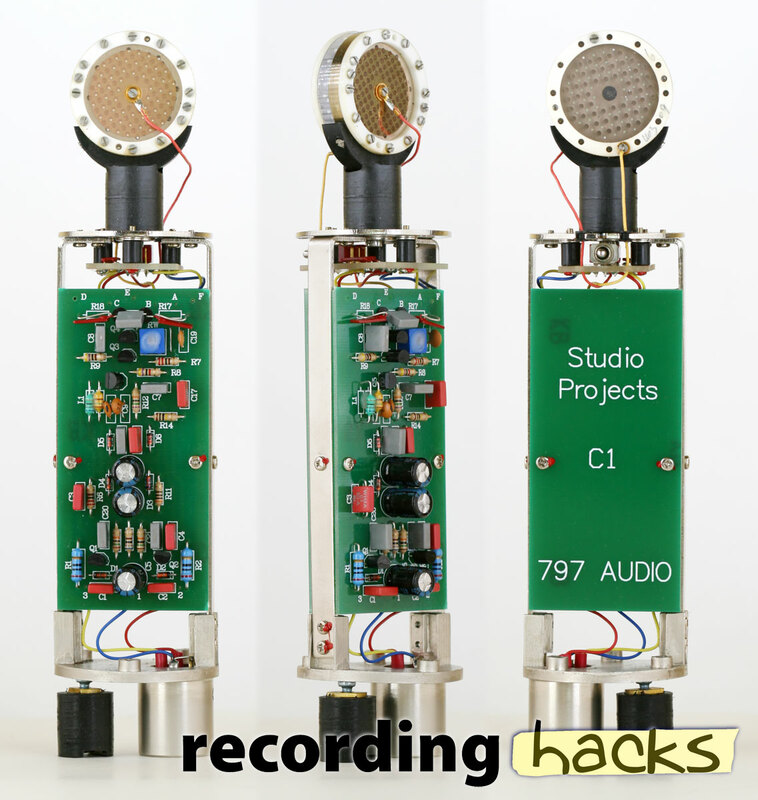 The “U87 EQ” mod kit for the SP/797 C1 microphone will recreate the high-frequency attenuation circuit from Neumann’s U87 within the C1. The kit includes a custom US-made PCB with adjustable EQ circuit. The mod also raises sensitivity, lowers self-noise, and reduces distortion. 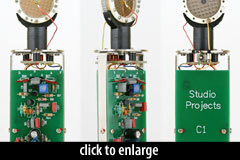 The original Studio Projects C1 microphone is a transformerless FET condenser with a large-diaphragm K67-style capsule and switchable pad and filter. The mic was revised in 2006; the newer version shows the Studio Projects logo, but no cobranding from 797 Audio. The capsule is a 34mm O.D. K67 derivative. The rear backplate is not brass, but perforated plastic. The rear diaphragm is clear Mylar. The circuit powers the capsule’s backplate with 43.5VDC. This value does not change when the pad is engaged; the pad is created by switching a 150pF ceramic capacitor into the high-impedance circuit. The entire circuit is implemented on a single PCB. The JFET is a 2N5457. The presence of the trimmer on the circuit board suggests that the JFET was biased after installation. The original C1 was commonly compared to the Neumann U-87, despite the fact that the circuits of these two microphones are very different from each other. Peggi started singing into the 87. Awesome, that classic Neumann sound that is heard on probably 90% of the records ever made. She then moved over to the C1 and sang into that. EXACTLY the same, no difference. We were all amazed. Ultimately, each of the Neumanns had a signature sound, as did the Studio Projects C1. Not even taking the price of the C1 into consideration, this mic stood up to some rather hefty opponents, and emerged as a contender. For any studio that runs out of mics quickly, or just doesn’t want to bust out the name brand mics for a generic session, it would serve them to have a pair of these around.